I wrote a book…a legit book! Well, I didn’t write it, God took my heart, my hands, and my brain to put words onto the screen. Over 60,000 words in fact! This book coming together has been all God’s doing. I merely showed up and acted on what God prompted me to do. How did I know it was His prompting? Because I asked him…daily! 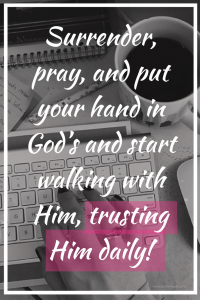 DAILY I showed up, spent time-consuming his words in the Bible, journaling the words in my heart, meditating on what He was telling me and praying for direction. DAILY I filled my heart and soul with His words. Asked for His plan and will to be done. DAILY I showed up to the computer and poured out His overflowing goodness within my soul. It was an incredible, spiritual and completely life-changing experience for me. Yet it’s only just begun! Soon I’ll be putting the manuscript through the editing process. You can follow my book journey on YouTube, click here. While writing, I had up and down days. The words were not always there. I had quite a few weeks of word drought and moments I wasn’t able to sit down and write. During those times I had to trust God, daily, that the words would come in His time when He was ready to share them with me. I preferred it that way. I never wanted any part of this book to be from me. I wanted it to be inspired by whatever God wanted to tell the reader and the writer… yep that’s me, writing it! Each moment, while writing the book, I had to trust in the Lord to share the words and I had to follow His timing on when they would come. Are you trusting God with each step and moment you take on your current journey? Are you allowing Him to show up and shine into your life so you can reflect his love and light to others? …I’d like to suggest that you start putting at least one hour a day aside for God. Get into His word. Use a journal to write out what’s on your heart. You may find that He uses your journal as a source of answering prayers and speaking into your life. And last but not least, pray. Spend time pouring your heart out to Him. He is listening. What is one area of your life where you feel you are not trusting God? How might your life change if you were to stop worrying and stressing? How would life be different if you spent an hour daily with God; speaking, listening and trusting Him? Comment below, I’d love to hear your answers to those three questions! 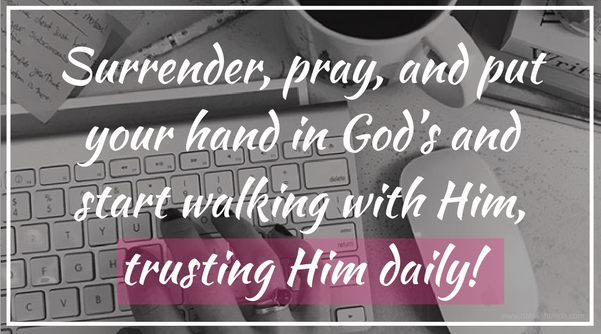 Surrender, pray, and put your hand in God’s and start walking with Him, trusting Him daily!